Waxwings © Sylvia Duckworth and licensed for reuse under this Creative Commons Licence. Rare waxwings are being spotted in Derbyshire, says the Derbyshire Wildlife Trust, with more set to arrive over the coming weeks. Waxwings are delightful, colourful birds the size of starlings. They have crests and small red, waxy projections on some wing feathers – hence the bird's name. In some winters they may turn up in the UK – often in town and city centres – and will feast on berry-bearing shrubs. 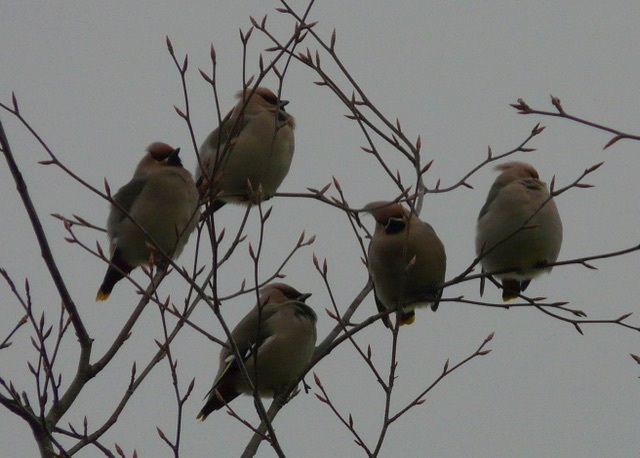 This is a 'waxwing winter': flocks of more than 500 birds appeared, first in Scotland, in November and December. Some birds will now stay in the UK until spring. When they have depleted the berries north of the border, they begin to move south – and now there are records of flocks across the Midlands. There have been many reports from Derbyshire since the beginning of the year, from Glossop to Derby city itself. Flocks can range in size from fewer than ten individuals right up to hundreds of birds. The biggest flock spotted in the county so far was 200 birds in Chesterfield. 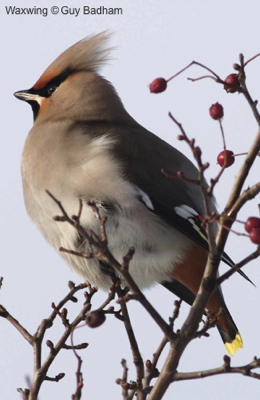 Waxwings are mainly spotted in the north and east of the UK, so please report any sightings of these rare birds!